Even though the web still seems like a relatively new invention, it's been around for a pretty long time now. Certainly long enough for people to start feeling nostalgic about sites they used to love that aren't around any more. We're talking about once-popular destinations like MP3.com, NTK.net and – well, someone must miss it – Boo.com. So, which sites used to be on your favourites list until they fell sadly off the web? They may have been closed entirely, or relaunched as sites that bore no semblance to their former selves. We're compiling an article – the article you're reading right now, in fact, called 'Websites you loved and lost', and we want your help. All you need to do is add your favourite dead site along with a few words on why it was so great. You can list your favourite sites of old via Twitter using the hashtag #imissthissite or in the comments at the bottom of this story. Please take part - ask your Twitter contacts to take part, too - and we'll update this article as the suggestions come in. And, of course, you'll be able to view the ongoing discussion by searching for the #imissthissite hashtag at search.twitter.com. 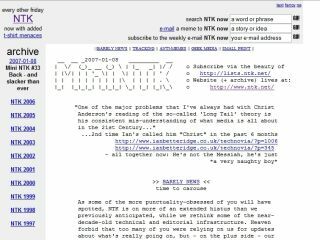 It's a bit of an experiment – trendy web types would call it something like a 'crowdsourced Twarticle'. But we know what needs to happen to them. So we'll just call it an article that we're all writing together, which will be complete when you say it is. Here are the sites that you've named so far. How many were in your bookmarks? Keep adding the sites you miss via Twitter (#imissthissite), or the comments, and we'll add them to the list!